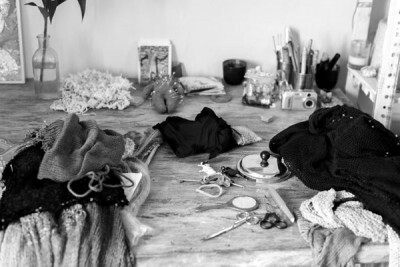 Ibiza Fashion formidable Gisela G invited us to her atellier in the island of Ibiza where she creates her striking and beautiful handmade pieces. Each of her creations is one of a kind and a true art investment. Gisela G: I was at school, I was 10, and I did this drawing that was the best in the class. It was a great feeling. F: What gets you to design these days? G.G: Every thing; the ocean, a person… I get inspired everywhere and by everything. G.G: Designers Issey Miyake and Yohji Yamamoto, and painters Gustav Klimt, Egon Schiele and Frida Kahlo… among many other. F: How would you define your work? G.G: It’s all me. It’s a feeling, and it’s very difficult to put feelings into words. I don’t sketch or anything first. It just comes out of me. F: What film is your life like? G.G: My life is my movie, I live my own movie. F: How is a day in the life of Gisela? G.G: When I get up I do yoga. Then I take care of the garden. Breakfast is next and I always like to read a bit. I paint or knit before and after lunch. And in the evenings I go around the village. F: What do you love and hate about Ibiza? G.G: What I like the most is that I live like I want, dress like I want… I can be myself here. It’s the spirit of Ibiza. I don’t like the drunk tourist with no tshirts on, and the high prices. F: Our motto is “A life less ordi­nary”, what makes life less ordinary? G.G: To be yourself, to express yourself, this is the most important aspect of life.